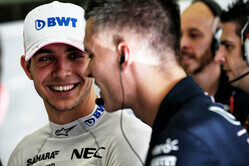 Sergio Perez: "It's been a positive day. We collected a lot of information and I'm happy with how things are going so far. The main conclusion I take from today is that the middle of the grid is very close once again and we will need to optimise everything to make Q3 tomorrow. I feel optimistic we can find some more performance tonight and the conditions could change for the weekend - we think it's going to be a bit cooler and there is talk of some rain. There is definitely a good opportunity for us to go well this weekend and be competitive." Esteban Ocon: "Things went well this afternoon and I got up to speed quickly. The information from Nicholas and Sergio this morning was useful and it was a pretty normal session. The main challenge was completing a clean lap with all the traffic, but we have done most of our homework today to help us get ready for the weekend." Nicholas Latifi: "Overall I'm quite pleased with my second FP1 session. Already from the first lap I felt more comfortable with the car and the whole race team environment after my first experience in Montreal. I know the track well and it was a straightforward session with some aero test items and tyre work. I chipped away at the performance lap after lap and from a personal point of view I felt more at ease compared to Montreal and felt more competitive. Obviously I will build on this experience so that I'm ready for the next time I'm back in the car for an FP1 session later in the year. " Otmar Szafnauer: "As forecast it was a hot day as we worked through a busy programme of test items and tyre learning on all three tyre compounds. Nicholas had a clean FP1 session and continued to make progress as he settles into the team. Sergio did the majority of our set-up work and the car is behaving largely as expected. There is still some work to be done to understand the car behaviour at these high track temperatures and we need to keep an eye on the weather forecast for the weekend in case it cools down. Hockenheim is a track where overtaking is possible, but with the middle of the pack so closely matched it's important that we maximise our qualifying session tomorrow. I think Q3 is achievable for both drivers." Check out our Friday gallery from Hockenheim, here.